I just installed Synergy 2.0.3 on my Linux Mint 18 machine. When I click the application icon, the GUI flashes for a split second and then disappears. I don't have a chance to configure synergy. Checked running processes and obviously it isn't running. Below is the output I receive when I try to open the GUI via command line. Any help would be greatly appreciated! "[ Config ] " "[2017-12-14T09:57:55] debug: install dir: /usr/bin"
"[ Config ] " "[2017-12-14T09:57:55] info: log filename: /var/log/synergy/synergy-combined.log"
"[ Config ] " "[2017-12-14T09:57:55] warning: version check disabled, skipping"
"[ Config ] " "[2017-12-14T09:57:55] debug: connecting to background service"
qrc:/ActivationPage.qml:65:21: QML Image: Binding loop detected for property "sourceSize.height"
"[ Config ] " "[2017-12-14T09:57:55] error: rpc connect failed: connect: Connection refused"
"[ Config ] " "[2017-12-14T09:57:55] error: rpc connection offline"
Well the issue was with the incorrect video card driver being used. However, the configuration panel is displayed without any options. Does anyone know what the issue may be? That's how it's supposed to look, I believe. The issue is that they released this as stable 2.0, when it's very clear that the feature set for 2.1 should be in the initial stable release. This is not stable, nor is it feature complete, and it's a huge regression in capabilities from 1.x. If you need to do ANY configuration beyond auto-config/bonjour, you may want to downgrade. Totally unacceptable IMO. Thank you for the reply Jig. Yes, I agree that is unacceptable. I have dual NICs installed.... How is this auto-config supposed to know which card i prefer to use? I wish I had an answer for you! I don't know where the configuration file is stored for Synergy 2 on all OSes, but it may be in /var/lib/synergy on your Mint machine. IMO it's only unacceptable because this wasn't made clear to people who were already using Synergy 1.x (for example, you may have postponed your upgrade until the release of 2.1 if this had been made clear). I've created a thread addressing this, and it is awaiting approval. Hopefully you are able to get this working manually; otherwise you may want to consider downgrading until 2.1 is released. "[ Config ] " "[2018-02-28T10:23:00] debug: install dir: /usr/bin"
"[ Config ] " "[2018-02-28T10:23:00] info: log filename: /var/log/synergy/synergy-combined.log"
"[ Config ] " "[2018-02-28T10:23:00] warning: version check disabled, skipping"
"[ Config ] " "[2018-02-28T10:23:00] debug: connecting to background service"
"[ Config ] " "[2018-02-28T10:23:00] debug: connected to background service"
"[ Config ] " "[2018-02-28T10:23:00] debug: sending uid to service: 1000"
"[ Config ] " "[2018-02-28T10:23:00] debug: saying hello to background service"
"" "[ Service ] [2018-02-28T10:23:00] debug: setting core uid from rpc: 1000"
"" "[ Service ] [2018-02-28T10:23:00] debug: saying hello to config ui"
Some of our moderaters are Linux gurus, maybe they will have a suggestion. The GUI you're seeing is not right yet, since it is not showing any screens. I would start troubleshooting by doing a thorough uninstall. Delete all files and folders that have Synergy. Then reinstall version 2,06 on all the machines in your network. Reboot after installation. 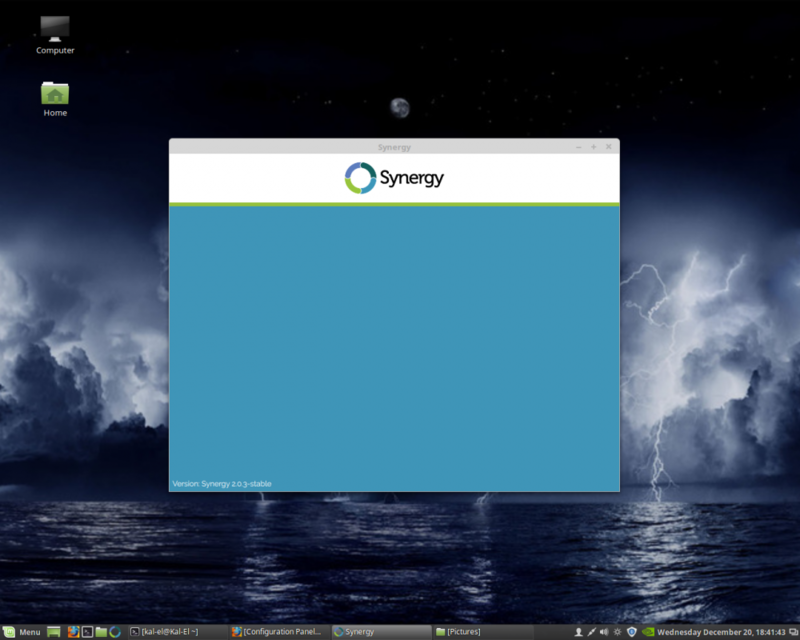 Sometimes, on any installation, stopping/starting the Synergy service a few times is necessary. What other OSs are you using?